The 2016 NFL season was one for the ages, complete with a familiar face accepting his 5th Super Bowl trophy on Super Sunday. 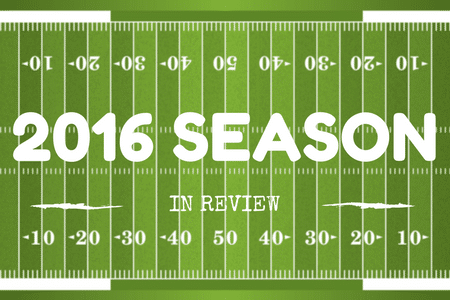 We take a look back at the 2016-17 NFL Season, the Playoffs, and Super Bowl LI in Houston. The surprise team of the 2016-17 NFL season was without a doubt, the Atlanta Falcons. Behind a stellar offensive attack and a surprisingly stingy defense, the Falcons claimed their first NFC title in decades, due large in part to league MVP, quarterback Matt Ryan. Ryan finished the 2016 campaign with career-bests in yards (4,994), touchdowns (38), interceptions (7), completion percentage (69.9%) and quarterback ratings (117.1). The evening before his Super Bowl LI appearance, Ryan would go on to be named the 2016 NFL MVP. The 2016-17 NFL season marked the first year since 1997 that former Indianapolis Colts and Denver Broncos quarterback and two-time Super Bowl winner Peyton Manning would not be under center. “The Sheriff” announced his retirement after his Super Bowl 50 victory in 2016 with the Denver Broncos, marking the end of his illustrious 18-year career. Sophomore quarterback Trevor Siemian would take over for the Broncos, although Denver would miss the playoffs. New England Patriots quarterback Tom Brady would finally go on to serve his four-game suspension, despite his multiple appeals, relating to the “Deflate Gate” drama from years prior. Despite Brady missing the first four games, the Patriots would be led to a 3-1 record by quarterbacks Jimmy Garoppolo and Jacoby Brissett, leaving the door open for Brady to come back and complete one of his best statistical seasons to date. The Atlanta Falcons and New England Patriots would square off in Super Bowl LI at NRG Stadium in Houston, Texas, in what would become one of the most exciting Super Bowls to date. Atlanta would hold a 28-9 lead heading into the 4th quarter, but with “Tom Terrific” leading the way, the Patriots were not to be counted out. Mounting the largest comeback in Super Bowl history, and creating the first overtime Super Bowl in league history, Tom Brady and the New England Patriots would capture their 5th Super Bowl trophy in the Belichick-Brady era. Brady would take home Super Bowl MVP, throwing for a Super Bowl record 466 yards and two touchdowns on 62 pass attempts.